Printing procedures is the order of 1,2,3,4 from the left in image. 1 a-block mixed gradation printing "Tukeawasebokasi"
2 b-block light pressure printing "Gomasuri"
3 c'-block light pressure printing "Gomasuri"
4 c-block hard pressure printing "Betazuri"
First, dampen to the block surface by giving a little bit water. Then put the pigment on the block surface. And put the starch paste on the block surface. 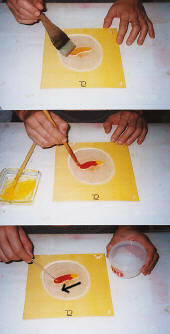 Put the starch paste from yellow to red. Because, it can not mixing the starch paste and the pigment on the block surface. "Tamari” is removed with a cotton swab etc. Because, it is printing of two colors, can not do brush "Hakebarai”. This block has a small color-block surface and "Sarai" is large. It should be noted that the motion of Baren is not off color-block surface at the printing. It is often seen in the ukiyo-e, one colore gradation of sky part, it is also said that "Ichimonjibokasi". First, give the water on the range of gradation. Put the pigment and the starch paste on the plate surface. Move the right angle brush to the direction to gradate by reciprocating motion. In other words, one colore gradation is that mixed color gradation of pigment and water. 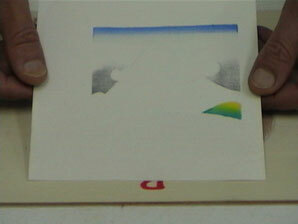 One-colore gradation seen in Ukiyo-e "Fukibokasi"
"Atenasibokasi" no-block gradation is that does not rely the block. There is only a block of the image size. First, it gives the water in the range want to gradation. 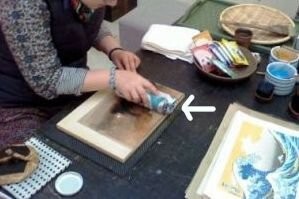 Then put the pigment and the starch paste on the plate surface. Move the brush to sweep the paint toward the center as the image.